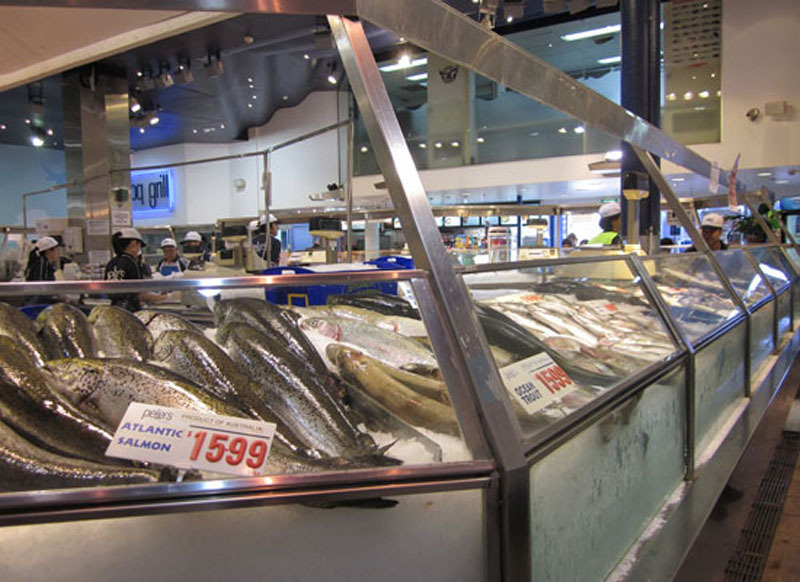 The Fish Market is one of the most popular tourist destinations in Sydney. Proceed along the avenue of fig trees. Parallel to you are the wharves at the head of Blackwattle Bay, including Hanson’s Concrete Batching hopper. At this wharf the coastal vessel Claudia disgorges gypsum for cement at intervals. The remaining wharves are currently berths for harbour cruise vessels, but are proposed for redevelopment. At the far end is the remains of the coal unloader that supplied fuel for the power station that supplied Sydney’s trams: now the Powerhouse Museum in Harris Street. Cross at the traffic lights to enter Sydney Fish Market, which has operated on this site since 1966. The large blue building, once the Australian Paper Mill warehouse, was taken over for the wholesale auction and to house more retail outlets. We recommend a wander around the colourful Market, and of course it is a good place to eat. The Sydney fishing fleet also berths here. After many delays a makeover for the Market was recently approved. Wentworth Park Light Rail Station is at the park end, and the Fish Market Station is near the northern end.